WASHINGTON — As Democrats are quickly finding out, gaining control of the House of the Representatives didn't mean the Trump administration was going to roll over on their requests for Trump's taxes and info on the Mueller probe. After all, the president still controls the executive branch, and he has his protectors inside the administration's top departments. 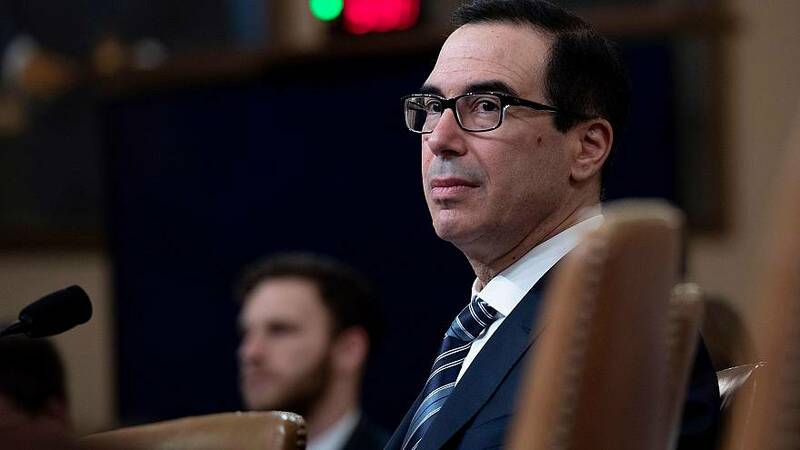 So on Wednesday, you had Treasury Secretary Mnuchin tell the chairman of the House Ways and Means Committee that he wouldn't be able to meet the deadline to turn over the president's tax returns. "I think spying did occur, yes. I think spying did occur. The question was whether it was adequately predicated," Barr told the Senate Appropriations Committee. "I think spying on a political campaign is a big deal. It's a big deal," he added. Note: Using the word "spying" to refer to opening a counterintelligence investigation based on a foreign tip that Russia had dirt on Hillary Clinton, or having surveillance on Carter Page (after he left the Trump campaign) is highly loaded for the nation's top law enforcement official. And they're going to have to decide which fights are worth pursuing and which ones might take them down rabbit holes from which they'll never emerge. Oh, and one other thing: Former Obama aides are asking why THEY got accused of politicizing the IRS, and Trump/Mnuchin aren't…. And NBC's Dilanian reports that the United States is making plans to seek his extradition - in connection with sealed federal charges in the Eastern District of Virginia, according to a source directly familiar with the situation. The nature of these charges isn't clear. The DNC emails it published - right before the Dem convention - lead to the ouster of party's chairwoman. And Trump mentioned the word "WikiLeaks" some 140 times in that last month. Elizabeth Warren's campaign announced on Wednesday that it raked in $6 million for the first fundraising quarter. Here's how her numbers stack up against the other 2020 Dem campaigns that have released their numbers. Don't miss the pod from yesterday, when we looked at how changing expectations about Elizabeth Warren's fundraising changed how her $6 million Q1 haul was perceived. That's Trump's approval rating among registered voters in Wisconsin, according to a new Marquette University Law School poll. Fifty-two percent of voters disapprove. Overall views of the president are basically unchanged from Trump's 44 percent approve/52 percent disapprove rating in the same poll in January, before the release of the attorney general's summary of the Mueller probe's findings. The new survey also found little change since January in Trump's re-election chances. Forty-six percent of voters in the state say they'll definitely vote for someone else in 2020, with an additional eight percent saying they will probably vote for someone else. A total of 42 percent of Wisconsin voters say they'll definitely (28 percent) or probably (14 percent) back him in the presidential election. NBC's Jonathan Allen writes that Trump is pushing the bounds of his power. Donald Trump's sister is retiring, which ends an investigation into her conduct over dubious tax schemes involving her siblings. Here's Ali Vitali on Elizabeth Warren's fundraising numbers. Trump's team is rushing to the defense of party-switcher Gov. Jim Justice in West Virginia.